Spice things up at dinner tonight! 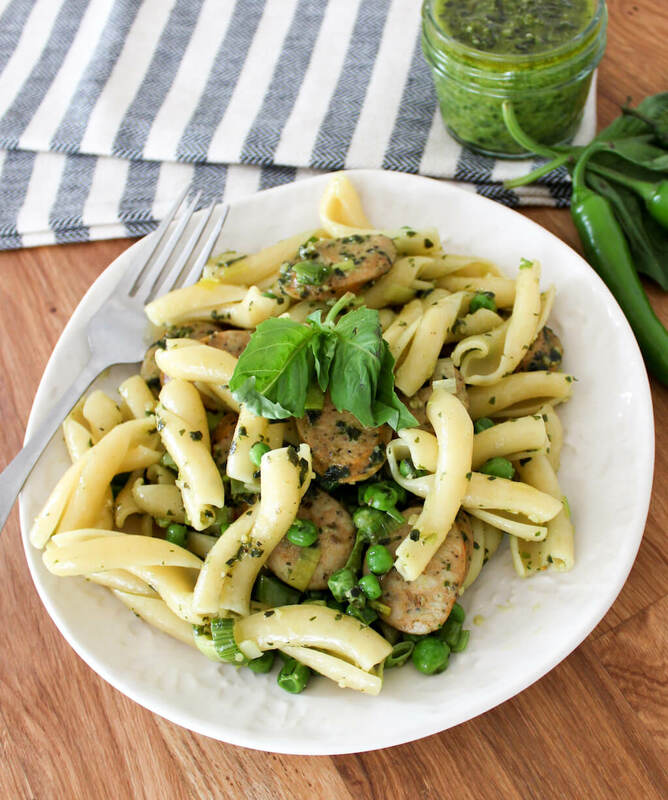 If you love pesto and foods that pack a spicy punch, this recipe is for you! 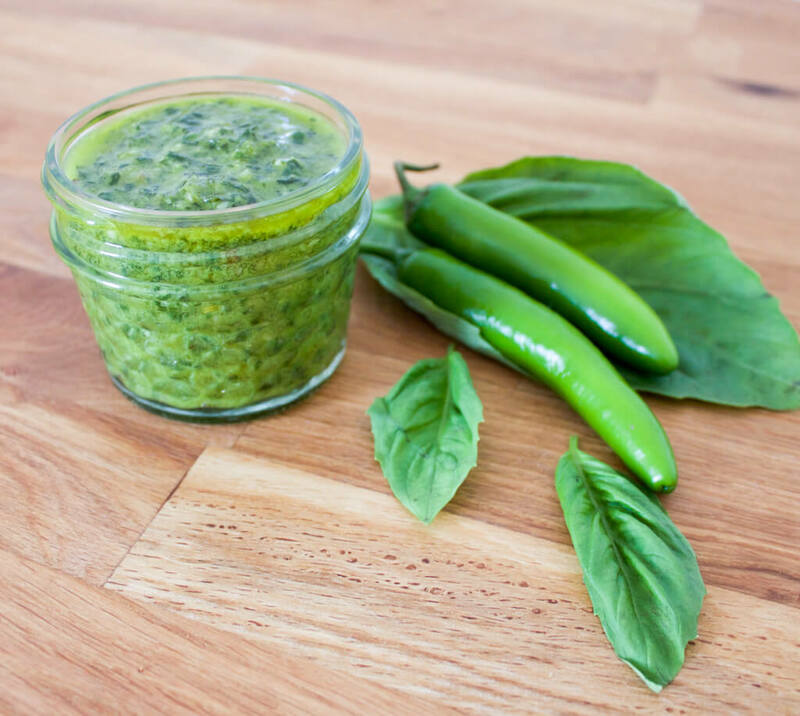 Serrano Pepper Pesto is a unique spin on a traditional favorite. 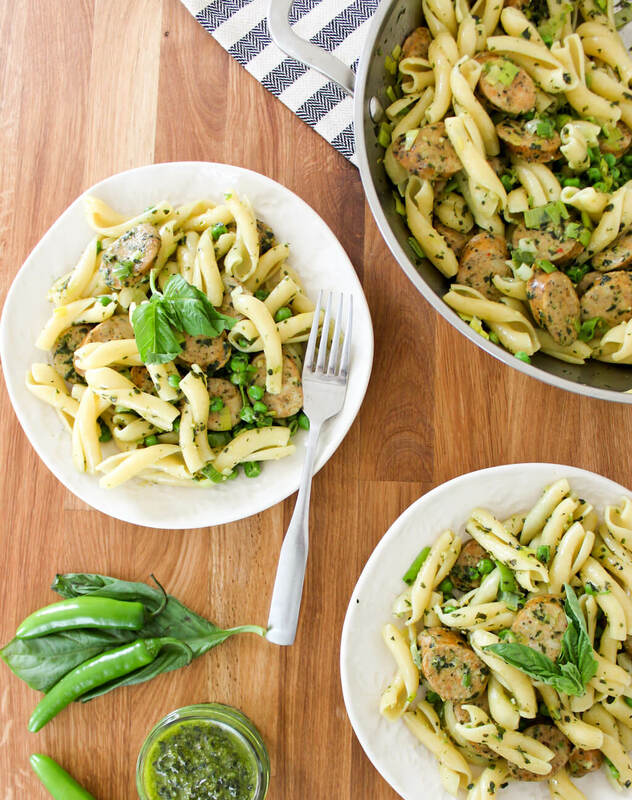 It can be served with any pasta dish and today we’ve paired it with Pasta with Chicken Sausage, Peas, and Leeks. 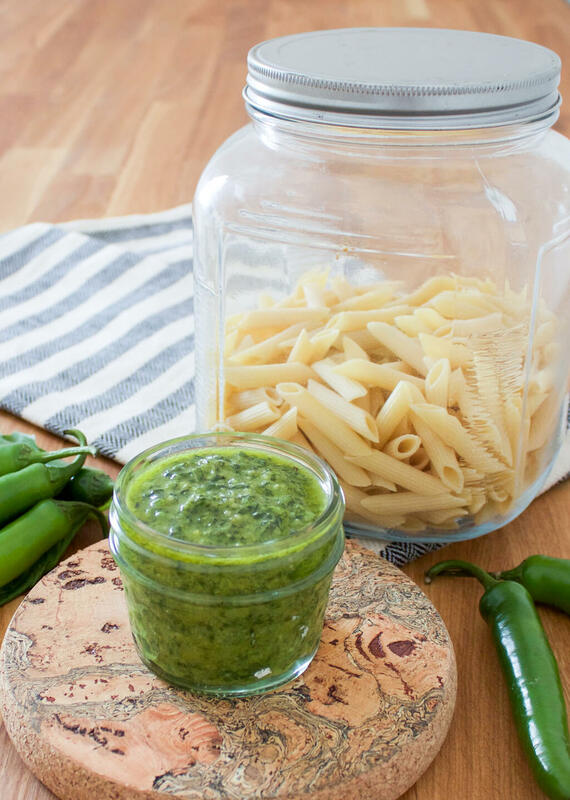 Serrano Pepper Pesto is made just the same way as traditional pesto with all the classic ingredients including basil, pine nuts, parmesan cheese, garlic, and olive oil but with the addition of serrano pepper. We added lemon juice for a bit of brightness. For more depth of flavor, we suggest browning the garlic before blending, although this step can be skipped if you’re short on time. This recipe calls for one serrano pepper which provides a medium level of heat. If you like your foods extra spicy, add another half of a serrano. If you like things milder, go with half of a serrano only. Although quite a bit smaller than jalapeños, serrano peppers look similar to them. Serranos and jalapeños also taste very similar. The main difference between them is the heat they offer. When it comes to which is spicier, serranos definitely win. They are about three to five times hotter than jalapeño peppers. 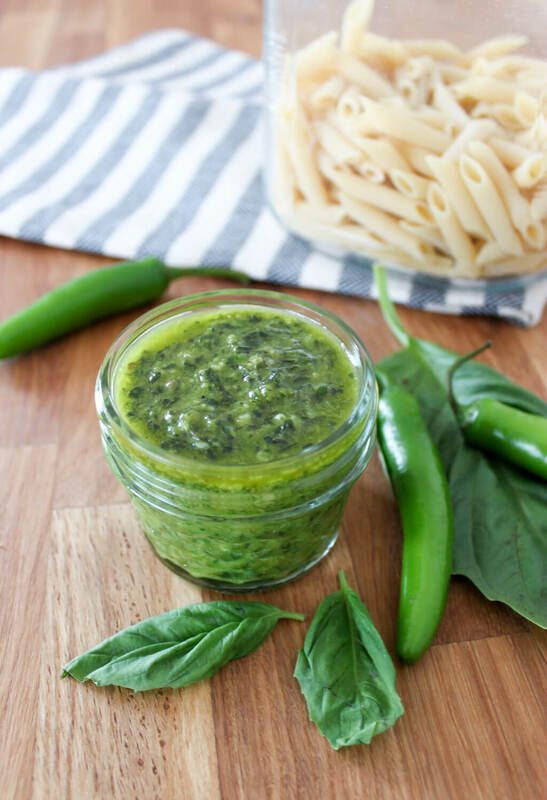 Serrano Pepper Pesto would be delicious drizzled over grilled vegetables, spread inside a grilled cheese sandwich, or as a marinade for grilled chicken. 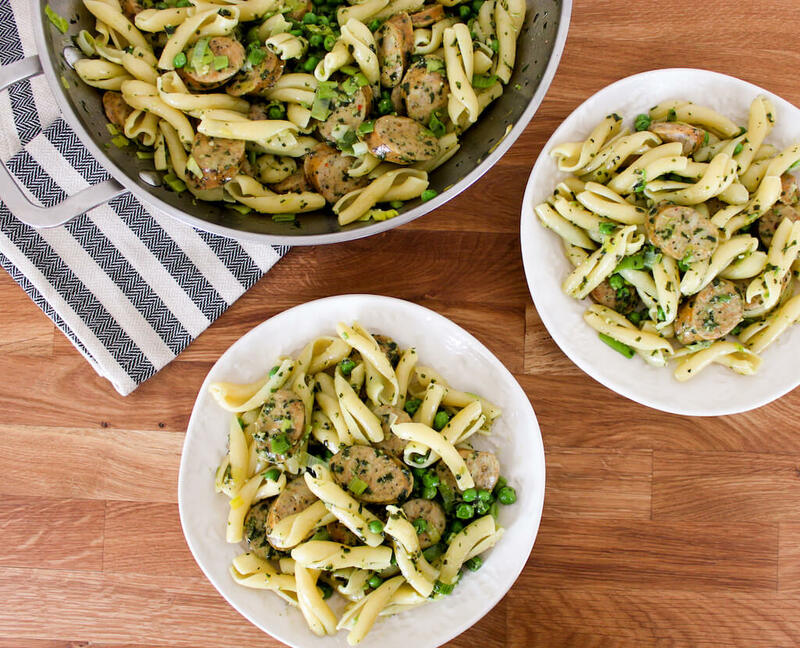 Today, we’re serving it on Pasta with Chicken Sausage, Leeks, and Peas. Like most of our pasta dishes, it whips up quickly yet is full of flavor. Make Pesto: Add olive oil and garlic cloves to a small saucepan and cook over medium-low heat for 4 minutes or until garlic is very fragrant and beginning to brown. Let oil and garlic cool for 5 minutes and then add to food processor. Add remaining pesto ingredients and process until desired consistency. Cook pasta according to package instructions. Add frozen peas during the last 2 minutes. Drain. 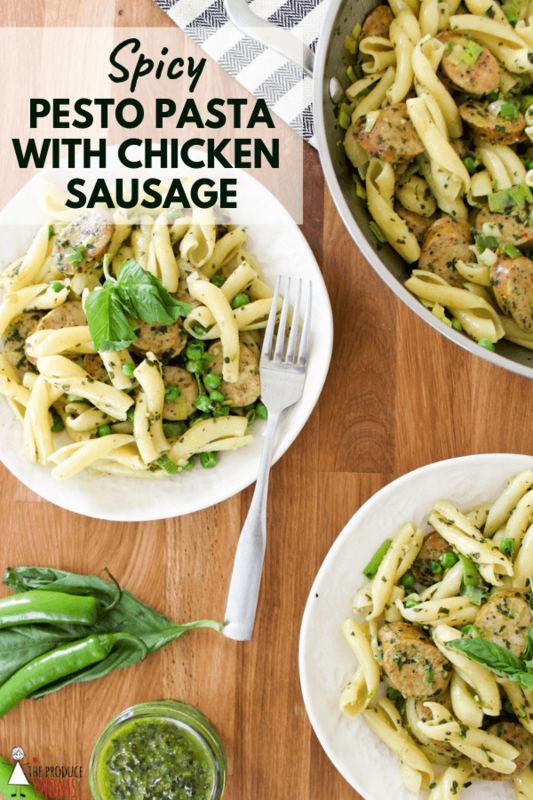 In a large skillet, heat up 1 TBSP olive oil and add chicken sausage. Cook 3-4 minutes or until it begins to brown, toss occassionally. Add leeks to skillet and cook for 3-4 minutes. 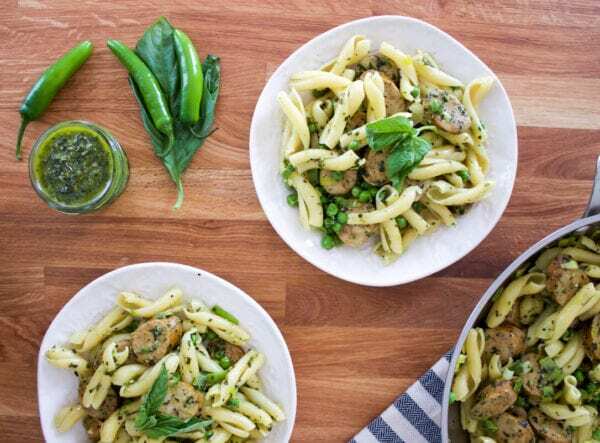 Add pasta and peas to the skillet and gently fold in serrano pepper pesto. Garnish with basil leaves and serve hot. Pesto can be made ahead of time and stored in a sealed jar in the refrigerator for a couple of weeks. To keep your pesto from drying out and browning, top it with a healthy drizzle of olive oil. Add another drizzle every few days to keep the basil fresh. Pesto can also be frozen and stored for even longer. It’s great to have on hand in the kitchen! 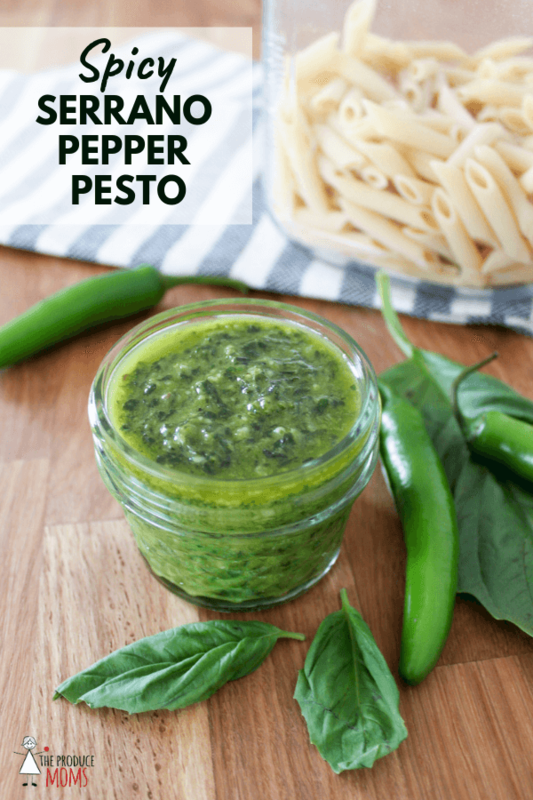 Swap in Serrano Pepper Pesto any time a recipe calls for classic pesto and you’re in the mood to spice things up! How will you serve it? Let us know in the comments below.